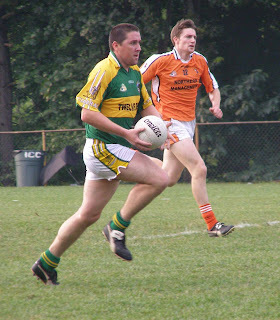 Tuesday evening (July 29) McAnespies defeated the Connemara Gaels by 1-17 to 0-14, which more or less ends the Gaels hopes of a senior playoff game. Sunday's game between Kerry and the Shannon Blues could well decide the fate of each team, with the winner having the best chance of the fourth senior semi-final berth. Also, with Christopher's managing a draw with Armagh-Notre Dame last Saturday, it looks as if the 3 teams that will will miss out on the intermediate playoffs are Christopher's, Mayo, and Cork - unless the Blues lose their last 2 games against Kerry and Galway, and Christopher's win their final game versus Kerry....you'd never know what might happen. With Tom's now out all that remains to be decided, next Sunday, is whether it will be Tipp or Wexford getting the extra weekend off and automatically making the final. Steady rain greeted Galway and Tipp on to the field as conditions turned from good to poor in the middle of the afternoon. Galway fielded a side with a conspicuous southern flair – no less than 5 Corkmen wore the maroon, and one Armagh native in Declan Coulter added some northern flavour. In spite of trailing by three points early in the second half, and losing captain Cronan Dempsey who was shown two yellow cards, Tipperary rallied with a courageous second half performance to put themselves on top of the table, and will play in a showdown with Wexford next Sunday for automatic final qualification for the final. Weather conditions hampered any chance of free-flowing hurling, and the first half was a fairly sluggish affair. 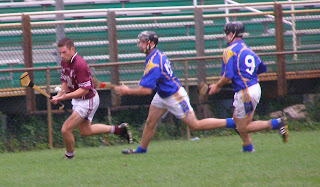 In the early going Jim Howard saved the bacon for Tipp on a few occasions. The Tipp keeper first saved from Declan Coulter, and soon afterwards kept his nerve to save once more from the Armagh man. Alan McCrabbe pointed twice, once from play and one free, to put Tipp in an early two-point lead. Corner back, Ritchie Hennessy did well for Tipp in the opening exchanges, the Ardmore Co. Waterford man made several timely clearances to deny Decan Coulter a chance at a score. In the meantime, a bizarre series of events, a throw-in resulted in Cronan Dempsey and Eoin Foley getting yellow cards. After the ball flew out of play immediately following a throw-in, just after the second throw-in Foley took exception to the way in which Dempsey was pulling on the ball – and him, and retaliated and a scuffle ensued. Foley and Dempsey were each shown yellow for their troubles. Alan McCrabbe about to Point for Tipp. Following the episode Galway awoke from their lethargy, and the tribesmen pointed five times without reply. Declan Coulter, Fintan O’Leary, fellow Ballinhassig clubman, Steven Dineen, and James Kinsella each put one over for the Galway club. Dineen pointed a second time after two shots for goal, the first was saved and the second driven across the face of goal before Dineen settled for the sure score. Galway were beginning to motor, while Tipp looked to be having problems coming to grips with the game. Tipp found their way somewhat, Gareth Sinnott and McCrabbe each pointed for Tipp, to one score from Coulter for Galway, in the last few minutes to inch Tipp closer. At the half Galway led by 0-6 to 0-4. Early in the second half Tipp suffered a loss in personnel. 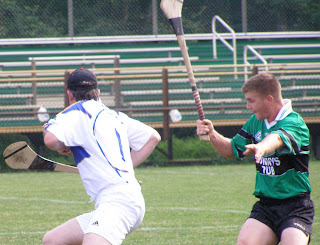 Cronan Dempsey was given a second yellow for pulling across Paul Carey, and as a consequence had to leave the field of play for the remainder of the game. With Tipp down a man things were looking good for Galway. Not for the first time in the history of hurling did the man down prove to motivate the shorthanded side. Tipp also had the benefit of a strong breeze in their favour. After Dineen put Galway three points up, Tipp got their act together in the half-back line and sent almost everything dropping in that area right back down towards the Galway goal. Galway could not make the extra man count. Still, scoring was at a premium, but Tipp rode the back of Alan McCrabbe’s free taking. McCrabbe brought Tipp level and at seven points each, and with Galway labouring to engineer any scoring chances, Tipp pulled ahead. Galway defended well, Kenneally did well at corner back and Darren Starr made a good save which kept the game within reach for Galway. Galway try to Clear as Tipp keep the pressure on in the second half. Fintan O’Leary pulled Galway within one point, but Tipp were not to be denied a famous victory. John McGrath and Alan McCrabbe sealed the win with a point apiece to the finish the game as the thunder and lightening rolled in. With the win Tipp are in contention for the final, while Galway face Tom’s in their last game with Tom’s out of contention. Galway: D. Starr, D. Kenneally, R. Goode, E. Foley, K. Murphy, D. Brennan, P. Carey, James Kinsella (0-1), D. Fitzgerald, Steven Dineen (0-2), Fintan O’Leary (0-3), Declan Coulter (0-2), J. Byrne. Tipp: J. Howard, J. O’Sullivan, R. Hennessey, T. Waters, J. Coughlin, G. Barry, S. Power, C. Dempsey, E. McCormack, F. Devanney, John. McGrath (0-2), Gareth. Sinnott (0-1), Alan McCrabbe (0-8). Cork's Niall Devlin gets away from his Marker. Donegal made short work of Cork in a one sided affair. With the rebels out of contention, and Donegal looking to book a place in the senior semi-finals, the motivation was with the northerners. Donegal did not need to shift into top gear to win the points from the game and sitting on 10 points, have now probably booked a place in the senior semi-finals. Keith Cunningham eludes the attention of Niall Devlin. Kildare man, Eamonn Murphy set the tone with a point right from the throw-in. Cian Griffin answered for Cork, but Donegal put 1-7 up before Cork scored again. Kevin Curran was in sharp form for Donegal, the seasoned campaigner put five of the seven Donegal points over the bar, two from frees. Ronan McNeilis and Donal McNulty were on top in the middle of the field as Cork struggled. The rebels did manufacture some decent chances, but they were few and far betweem. The best of them fell to lively Niall Devlin who was put through on goal, but Niall McConnell was equal to the shot and parried it over the bar for a point – Cork’s second and final score of the first half. Eamonn Murphy put a goal away before half time, the Leixlip man slid the ball into the far corner from the edge of the small square. At the half time whistle Cork were 10 points in the hole, 1-9 to 0-2 with little chance of digging themselves out of it. 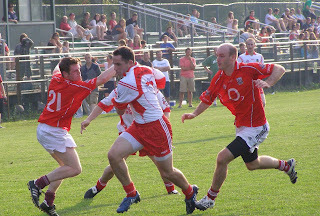 Cork's Mike Moynihan and Ronan McNeilis Contest a kickout. The second half was more of the same. Donegal eased off a little through the second 30 minutes. There was not much chance of an upset of the sort from the previous evening when Galway defeated the Wolfe Tones, and Christopher’s came within a whisker of upending Armagh-Notre Dame. Donegal introduced a few subs in the second half, and Cork tried to shift things around to get more change out of the Donegal back line. 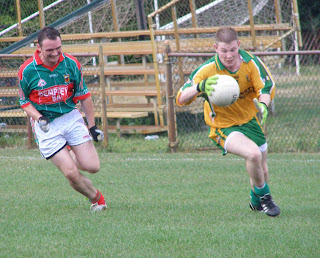 Kieran Connolly took a more forward position, while Devlin came deeper out the field. Cork fared better on the balance of play, but there was no doubt about who the winner would be. Conrad Bradley and Mike Moynihan get their names on the scorecard in the second half for Cork, but Declan Murphy, Eoin Wade, Eamon Murphy, Ronan Diver, and Kieran Mulvihill got in on the scoring act for Donegal. Not much of a test for Donegal, who may get a better gauge of where they stand when they face the Connemara Gaels in two weeks time. Cork: K. Reid, M. Carolan, S. Caulfield, D. Kearns, J. Leonard, A. Creagh, Mike Moynihan (0-3), K. Connolly, D. O’Flynn, Conrad Bradley (0-1), K. Moriarty, Niall Devlin (0-3), Cian Griffin (0-1). Donegal: N. McConnell, S. Lee, T. Maguire, P. Witherow, K. Cunningham, Eoin Wade (0-1), D. McNulty, R. McNeilis, Kevin Curran (0-6), Eamonn Murphy (1-4), Ronan Diver (0-1), Declan Murphy (0-2), G.Concar. Sub: Kieran Mulvihill (0-1). Gareth Concar gets around his man. Donegal dispatched Mayo with little difficulty on a hot and humid afternoon. Mayo kept it level thru the end of the first quarter thanks to a somewhat fortunate goal, but after that Donegal imposed themselves on the game were always in control. From the middle of the field to lively corner forwards, Gareth Concar and Declan Murphy, Donegal dominated proceedings and set themselves up well for the run-in to the playoffs. The expectations were for Donegal to win this game, and the first half underlined the superiority of the northerners. Mayo put a point and goal together midway through the half, but spent most of the time trying to hold their opponents at bay rather than thinking too much about engineering scores of their own. Donegal put four points over the bar before Mayo got off the ground. Gareth Concar, Ronan McNeilis, and Kevin Curran each pointed for Donegal before Ronan Rochfort got Mayo on the scoreboard after 12 minutes. Mayo leveled the scores soon after with a goal from Sean Gerrity that might have Donegal management concerned with the defending.. A point attempt came high off the post, and Gerrity was waiting unimpeded to gather the ball and slip it below the keeper. All square. Not for long though as Donegal put another six points over the bar in the latter part of the half, while Mayo laboured to match their opponents. Gareth Concar and Declan Murphy were full of running in the Donegal full forward line. Concar was a major threat for Donegal, and had three points in his name before the half was out. Dualtach Molloy pointed twice before half time to put Donegal at a six point advantage. Mayo claimed the first two scores of the second half – both points, and almost goaled but Pat Hickey’s shot came back into play off the inside of the post. Had it gone in it could have rattled Donegal nerves and provided Mayo with a platform to attempt a comeback. Donegal center forward, Eamonn Murphy played a part in Donegal’s response. Murphy put a dead ball over the bar with a free from 50 yards, and then found Dualtach Molloy for a second point to restore Donegal’s six point advantage. Gervaise Toner fisted over a great point for Mayo after 10 minutes, but that would be it for the westerners. Donegal went on to finish the game with four unanswered points, Molly, Concar, and two from Murphy, and put themselves in a good position senior championship playoff hunt. Donegal: N. McConnell, T. Maguire, S. Lee, P. Witherow, K. Cunningham, N. Hegarty, D. McNulty, Ronan McNeilis (0-1), Kevin Curran (0-1), Eamonn Murphy (0-2), Dualtach Molloy (0-4), Gareth Concar (0-4), Declan Murphy (0-4).. Mayo: D. O’Malley, S. Clifford, M. Murphy, C. Clifford, M. Hunt, T. Scanlon, Ronan Rochford (0-2), C. Brennan, Rory Gavin (0-1), Gervase Toner (0-2), Sean Gerrity (1-0), P. Hickey, B. McStay. Tir na nOg wing forward Colleen Barrett shoots. Tir na nOg dominated the game for almost all of the 60 minutes, with a brief exception in the middle of the second half. In spite of a great start, Roscommon played second fiddle to Tir na nOg who were on top in most areas of the field. When Roscommon saw a glimmer of hope late in the second half, Tir na nOg shut the door in clinical fashion, underlining their championship credentials. The first half was all Tir na nOg. The Brighton side put together some great passing moves and played the ball well out of defence to shut Roscommon out of it for the first 30 minutes. Maria Keane notched three points from frees and four others came from Colleen Barrett, Kate Murphy, Lisa McAleer and Angela Monaghan. Roscommon got off to a dream start with a point followed right away with a goal. However, the Rossies would go blank for the remaining 28 minutes of the half. The Tir na nOg back line were on top of their opposite numbers, and forwards looked threatening with almost every attack. Roscommon struggled to make anything happen in their favour. The brightest spot of the first half was two saves in close succession from Roscommon goalkeeper, Niamh Kavanagh, but when your keeper is producing the highlights, the signs are not good. At the half it was 1-1 to 0-7 in favour of the Brighton side. The second half continued the way of the first with Tir na nOg looking likely winners and took their foot off the gas a little. 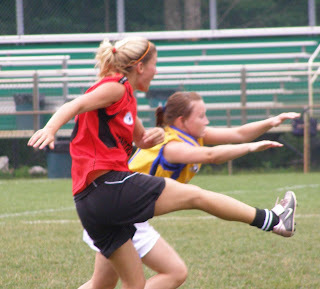 Center forward, Katie Murphy, was in control of the forward line for Tir na nOg. Murphy goaled after two minutes of the restart to put Tir na nOg ahead by seven, Maria Keane pointed and mid-way through the half substitute Colleen Jordan made it a ten point game. It looked very much a done deal at this stage. But Rosommon hit back with a flurry of scores. Corner forward, Fiona Claffey finished the best Roscommon move of the day with a point, their first score in almost 40 minutes of play, and soon afterwards shot low into the corner of the net to pull Roscommon closer. Roscommon enjoyed a brief period of pressure, and Karen Maloney pointed twice from frees to bring Roscommon within four points, and with five minutes still on the clock there was a chance for Roscommon. Tir na nOg, however, were not in the mood for a tense finale and upped their performance. Two points dispelled any notions of a sensational finish. Colleen Barrett expertly fisted over the bar and Aimee Molloy pointed having made a run from her half-back position with time almost out. Tir na nOg had been guilty of letting opponents back into the game, not so this time as they maintained concentration until the end. Tir na nOg: F. Gohery, B. Durkan, S. Crampsie, L. Brick, Aimee Molloy (0-1), D. O’Sullivan, S. Bourke, J. Moran, A. McDaid, Colleen Barrett (0-2), Katie Murphy (1-2), G. McClean, L. McAleer, Angela Monaghan (0-1), Maria Keane (0-4). Sub Colleen Jordan (1-0). Roscommon: N. Kavanagh, P. Bourke, J. O’Connell, L. Burns, J. McCavana, J. Rogers, C. Melia, K. McManus, C. Benson, Sharon McGovern (0-1), Karen Maloney (1-2), M. Fox, R. Finnegan, J. Reynolds, Fiona Claffey (1-2). Tipperary and Fr. Tom’s played a tough, hard game of hurling that saw the lead change hands several times down the stretch only to end all square, the result probably being a fair reflection of the game. 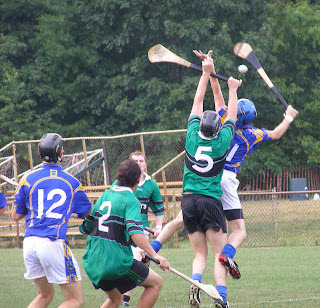 Neither side managed to gain an upper hand for any sustained period of time, and when one side threatened to put some distance between the teams, the other hit back with a flurry of scores in an exciting 60 minutes of hurling. The first half had it all, plenty of great hurling, four goals, three bookings, and a rain delay. A thunderstorm blew through and the game was held up for about 10 minutes until the weather cleared. Tom’s had gotten off to the better start, taking a three points to one lead, the pick of the scores was an Owen Moran solo effort after the Round Towers man had fought hard to win the ball, pointed from 45 yards. Tipp got themselves into a one point lead before play was halted thanks to an Alan McCrabbe goal from a 14 yard free. Tipp then edged themselves into a three point lead after the restart. 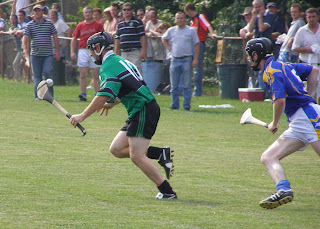 Gareth Sinnott, McCrabbe ,and Cronan Dempsey fired over 5 points between them while for Tom’s Noel Kelly and Joe O’Leary put three over for Tom’s. Tom’s then put themselves into the lead thanks to a Noel Kelly goal, and Ciaran Moore followed suit shortly thereafter with a second. Tom’s were looking to be gaining the upper hand, playing long, low raking passes around the field, when Tipp struck back just before half time with a flurry of scores. Center back, Francis Devanney, led the charge with a fine point McCrabbe, and Gareth Sinnott added one more each, and a goal came just before the half time whistle through McCrabbe, who was having his best outing so far in Boston, put Tipp two to the good going into the break. 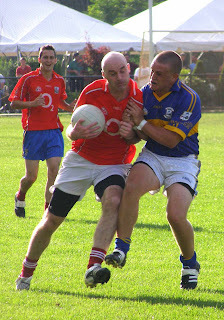 Joe O'Leary (5) and Alan McCrabbe Contest a High Ball. The second half was more of the same, with neither side managing to establish any decisivecontrol over the game. After Noel Kelly pointed for Tom’s, John McGrath netted for Tipp to extend their lead. Shortly thereafter Tom’s came charging back. A point from O’Leary was followed by a Niall Healy goal. Healy was found running through by Noel Kelly and buried the shot. Healy was through in identical fashion a minute later and this time took the point to make it all square at 3-10 each. Donal Moore and Niall Healy put Tom’s up two, and Tipp leveled. A McCrabbe free put Tipp one up, and within 2 minutes, Noel Kelly and Ciaran Moore had Tom’s one the good. And with seconds remaining McCrabbe leveled the scores for the final time with a free from about 30 yards. Tom’s earn their first point of the championship and will need the maximum from their last two games against Wexford and Galway to have any chance of making the playoffs. Tipp: J. Howard, J. O’Sullivan, R. Hennessey, M. Jordan, F. Devaney (0-1), J. Caughlin, S. Power, G. Barry, Thomas Waters (0-1), Cronan Dempsey (0-1), Alan McCrabbe (2-7), Gareth Sinnott (0-2), John McGrath (1-1). Tom’s: D. Hession, J. Dowling, C. Dolan, D. Kennedy, Joe O’Leary (0-3), T. Mulligan, T. Kelly, D. Hardiman, Owen Moran (0-1), Ciaran Moore (1-1), Niall Healy (1-2), Noel Kelly (1-5), Donal Moore (0-2). Armagh-Notre Dame came out on the right side of an evenly contested game with this year’s surprise package, Kerry. In doing so the Orchard County kept themselves in the senior championship playoff hunt. Having missed a first half penalty that was woefully struck, Armagh capitalized in the second half when the opportunity presented itself a second time, and Brendan Quinn’s well struck shot provided the slightest of advantages that proved to be the difference in the end. Kerry looked like the slightly better side in the first half. The Kingdom certainly played the better football, searching for their men in the forward line with measured passes. Armagh-Notre Dame on the other hand looked short on ideas and on several occasions hoofed hopeful balls into the full forward line in the hope that something good would happen, and there were no occasions where it worked to their advantage. Kerry corner back, Steven Moriarty was well positioned to deal with most of the ball played into the Armagh-ND full forward line. Armagh-ND did have some success in the early going, Martin McStravog opened the scoring, and after Richard O’Sullivan leveled for Kerry, Armagh went one ahead again through a Brian Downes point. 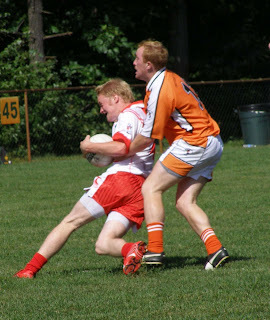 Leading by a point, Armagh-ND won a penalty for a foot block on McStravog, and the center forward stepped up to take it himself and mis-kicked the shot so badly thar Dave Diggns simple bent down and gathered the rolling ball. Kerry then put two scores together to go ahead by one, Mark Evan and Mike Godley, Godley’ s shot was parried over the bar by Cathal Brady. The northern side should have done better with some of their early chances, however, got their act together enough to put three points over the bar without reply. Charlie Kielt scored a fantastic point, James Kielt a second, and the third was scored courtesy of Downes. 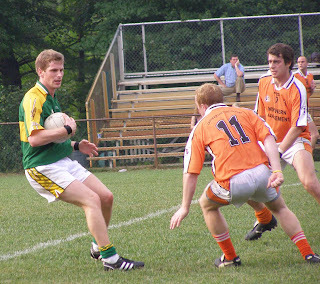 Kerry, however finished the half the stronger of the two sides as their opponents lost their way. Colin McDonnell entered the fray as a sub and made his presence felt with a score, while Mark O’Sullivan and Bernard O’Connor also pointed to make it 0-5 to 0-6 in Kerry’s favour at the half, and Kerry looking the better side. The second half was almost a mirror of the first, with the difference being that this time around, the Brighton based side capitalized on a second penalty chance. Early in the half Brendan Quinn made no mistake with the shot and the Orchard County were two to the good. Kerry hit back with a point from McDonnell to narrow the gap, but Armagh would not let the lead slip. Charlie Kielt stepped it up in the middle of the field and Kerry did engineer some scoring chances that went awry, and proved costly in the end. O’Sullivan eventually pointed twice for Kerry, but Armagh answered through Kielt and McStravog and were able to maintain their slight advantage through to the final whistle with a dogged display. With two games left the northerners are still in the hunt, but have a tough assignment coming against the Wolfe Tones. Kerry could have almost solidified their place but will have to make the most of their remaining games with the Shannon Blues and Christopher’s. Galway and Wexford played a hotly contested game of Hurling with Galway having a chance to share the top spot with Wexford. With the juniors having won earlier in the day, the Galway seniors made it two for two with a solid win. In the forward line Fintan O’Leary and Declan Coulter were prominent for Galway, and James Kinsella and Paul Carey did well in the middle of the field. 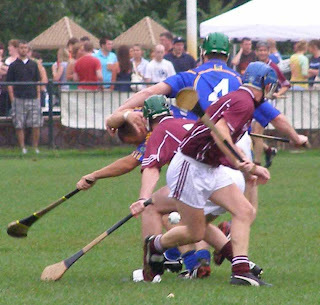 It was not until midway through the second half that Galway began to pull away, and three goals in the period secured the points for the westerners. Galway got off to the better start with five points on the trot. Declan Coulter showed some expert marksmanship, the Armagh man scoring four of the five, and Ballinhassig, Co. Cork, native Fintan O’Leary pointed once. Kilkenny prodigy, Gavin Nolan answered for Wexford after 10 minutes. Edmund Sproul then made a fantastic save for Wexford to deny Galway a certain goal, and the save signaled a scoring spree for Wexford. Gavin Nolan stole in behind his man and beat the keeper from 14 yards to bring Wexford within a point. Shane Hennessy then pointed from the wing and it was all square. The sides traded points until half time, with Wexford getting the extra to put them ahead going into the break. Hennessy and Nolan pointed for Wexford and Stephen Dineen and Fintan O’Leary for Galway. Galway turned it up in the second half. After Mick McMahon and Dominic McGill swapped scores, McGill’s point a superb long range effort, O’ Leary buried a goal to put Galway two to the good. Wexford answered in expert fashion with three points, Shane Hennessy, Dominic McGill, and Nicky Quinlan pointed, with Quinlan’s score put Wexford one to the good. Wexford looked like they could gain control the game, and looked the more likely winners at that point, but Galway had other ideas. Coulter put the tribesman ahead once more with a goal. Christopher O’Connor had a great chance to put Galway further ahead as he found himself with just Sproul to beat in the Wexford goal, but he mis-hit his shot and Sproul happily gathered the sliothar to clear. A third goal for Galway came through O’Leary. A high ball was forced into the back of the net from close range. Gary Burke, who had come on as a sub pointed twice on the trot to put Galway seven points up with eight minutes remaining. Paul Carey and O’Leary each pointed for Galway, to three points down the stretch for Wexford, to get themselves level at the top of the table with Wexford. The defending champions, Wexford, must be looking over their shoulders having suffered their first defeat in 2 seasons. Wexford: E. Sprun, B. Dalton, P. Holden,D. Redmond, Dominic McGill (0-2), D. Brennan, Nicky Quinlan (0-1), R. Kehoe, J. Clarke, P. Ryan, Shane Hennessy (0-4), Gavin Nolan (1-4), Christy O’Connor (0-1). Sub; (0-2). Galway: D. Star, M. O’Donnell, D. Kennelly, E. Foley, K. Murphy, D. Brennan, J. Kinsella, Paul Carey (0-1), D. Fitzgerald, Stephen Dineen (0-1), Fintan O’Leary (2-4), Declan Coulter (1-5), J. Byrne. Subs: Mick McMahon (0-1), Gary Burke (0-2). Cork’s season of woe continued as the Shannon Blues won convincingly with Cork having played reasonably well for periods of the game. The Blues were always a little bit ahead of Cork in most areas of the field, however. The only real threats for Cork up front were Niall Devlin and Mike Moynihan, while the Blues has some scoring threats in Gary Gaughan, Philip Lydon, and Thomas Cryan, amongst others. The Blues had established a six point lead by half time, and early in the second half Devlin netted to bring the rebels within three, but Lydon answered in kind for the Blues a minute later to stifle any chance of a Cork comeback, and make the outcome a foregone conclusion. Devlin opened the scoring for Cork in the first half with a well- taken point, and was answered by Darren Wallace for the Blues. Another Devlin point was answered by Lydon. Mike Moynihan then put Cork ahead for the last time in the game with a good score after 10 minutes, and the Blues scored 1-3 without reply for the remainder of the half – and did not look back. Gary Gaughan was a threat for the Blues on the wing, and Cork persistently fouled the speedy wing forward as he made threatening runs through. Gaughan leveled the scores with a point, and Philip Lydon got the go-ahead score shrtly thereafter. Late in the half, Lydon goaled to put the Blues four to the good, 1-5 to 0-3. Cork’s goal early in the second half gave them some hope, but the Blues answered in kind and went on the ease to a comfortable victory. After Lydon’s goal, Darren Wallace pointed and Lydon completed his hat trick with 15 minutes to go to put the Blues 10 points to the good. Mike Moynihan pulled two points back for Cork, and Devlin another goal, but Ken Kileen, who came on as a sub, rounded out the win for the Blues with a goal at the death. With the Blues on six points, a playoff berth in the senior championship is still possible. Blues: D. Hawes, K. Cryan, S. Kelly, S.Ruane, C. O’Grady, N. Ewing, S. Henry, R. Hennessy, G. Henry, Thomas Cryan (0-2), Gary Gaughan (0-2), Darren Wallace (0-2), Phillip Lydon (3-2). Sub; Ken Kileen (1-2). Cork: K. Reid, M. Carolan, S. Caulfield, K. Moriarty, J. Leonard, D. Kearns, A. Creagh, K. Connolly, C. Griffin, D. Flynn, A. Bourke, Niall Devlin (2-1), Mike Moynihan (0-3). McAnespies came away convincing winners for the second week in a row. After 20 minutes or so the game was up for Armagh-Notre Dame, and not so much because the orchard county was outclassed, but because there were three goals conceded. Going down by three goals so early to a side like McAnespies is a death sentence. The Brighton based side competed well, and may have been behind a little on the balance of play, but certainly not to the extent that the scoreboard suggested. McAnespies had a goal and a point up on the scoreboard within the first two minutes. Laoisman David Conway was responsible for both, the point a lovely score from a tight angle and the goal came straight afterwards, a great start for McAnespies. Armagh-Notre Dame pointed twice in response, both from Brian Downes. Johnny Laverty then pointed for McAnespies , and McStravog for Armagh-Notre Dame. Armagh-Notre Dame were holding their own at this stage, but two quick goals from practically nothing mid way though the half killed off their efforts. For the first, Declan Lally found Conor McGourty with a lovely pass and McGourty turned his man and buried the ball. Shortly afterwards David Conway caught a high ball behind his marker and with just the keeper to best, blasted home. The scoreboard now showed McAnespies ahead by 10 points, but that was a unfortunate for Armagh-Notre Dame since they had been holding their own. Armagh heads dropped a little, and Conway and Lally each pointed before half time to ensure that Armagh-ND were going to have a very high mountain to climb should they do the unlikely and get back into it. 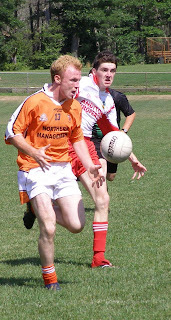 Derryman, Martin Donaghy, on a run to Goal for Armagh-Notre Dame. Armagh-Notre Dame battled on the second period, and in the early stages looked like they might be making a comeback. Martin Donaghy scored a great individual goal, the Derryman won a low ball into the forward line, shook his man and goaled off the underside of the crossbar. Donaghy followed up the goal with a fine point, and things began to look like they might get interesting again. Not so, McAnespies netted twice in the middle of the second half, once through Christy Lynch, and again through Lally, who was once again in flying form. Again, the Armagh men allowed the game to get away from them. McGourty won the ball with his back to goal in the large square, and before even turning was pulled down by Armagh-ND keeper, Emmet Murphy. Lynch took the penalty and that was the end of that as the ball hit the back of the net. Galwayman, Mark Goettsche and another St. Bridgets (Dublin) clubman, Graham Norton were introduced in the second period. Goettsche pointed twice during his time on the field, and McGourty and Colm McCrory added the tally for McAnespies. Armagh-Notre Dame now have to win their remaining two games to have a chance for the senior championship playoffs. Macs: D. Traynor, Christy Lynch (1-1),M. Stanbrook, D. Donegan, N. Kerr, A. Feeney, D. McBride, Declan Lally (1-1), Colm McCrory (0-2), Johnny Laverty (0-2), K. Cahill, David Conway (2-3), Conor McGourty (1-1). Subs Mark Goettsche (0-2), G. Norton. Armagh-ND: C. Brady, C. Gallagher, M. Dwyer, J. Taggart, A. Downes, F. Meehan, C. Keilt, B. Quinn, Brian Downes (0-2), James Keilt (0-2), Martin McStravog (0-2), Martin Donaghy (1-2), C. O’Connor. The Boston Shamrocks continued on their winning ways with a close victory over Roscommon in an extremely exciting game of football. The Shamrocks went in at half time down by 7 points, and replicated their performance of last week against Tir na nOg by staging a tremendous second half comeback to win by a single point. The first half was tight in the early going with neither side getting the better of the other. After 15 minutes the Shamrocks were ahead by five points to three. Kildare’s Aisling Jennings accounted for three of the Shamrocks points, and Maria Modrick two. Belcoo’s own Sharon McGovern was in top form in the Roscommon forward line and put two over the bar, and Karen Maloney the third. Roscommon netted twice in the second quarter to take a lead going into half time. Geraldine Reynolds put both goals away, and put Roscommon into a commanding lead. Sharon McGovern pointed twice and Karen Maloney once to give Roscommon a comfortable cushion to sit on going into the second period. Like the week before, an early second half goal brought the Shamrocks back into it, and raised some doubts amongst the Roscommon players. Aisling Jennings, who is proving to be a star on the Boston stage, was the one to put the ball away, and with one kick of the ball there were only four points in it. Maria Modrick and Jennings each pointed again, and were followed by Louise Collins, which left one point between the teams. Roscommon pulled away again through points from Fiona Claffey, Maggie Fox, and Karen Maloney, but there were still a couple of goals left in the Shamrocks. Jennings goaled to bring the Shamrocks within two points, and Reynolds scored the winner just before the final whistle. The last few weeks have shown that there is nothing between the teams in the ladies football championship. Though the Shamrocks are on top of the table and Roscommon have yet to win a game, it is all to play for. Shamrocks: M. Harrison, S. Boylan, J. Rock, S. Killeen, L. Stephenson, S. McHugh, M. Cullen, C. McEleaney, M. Modrick, S. Walsh, A. Jennings, L. Collins, S. Kelly, T. Kealy, O. McGuirke. Roscommon: N. Kavanagh, P. Bourke, J. O’Connell, L. Burns, J. McCarron, J. Rogers, C. Melia, K. McManus, C. Benson, S. McGovern, K. Moloney, M. Fox, R. Finnegan, G. Reynolds, F. Claffey. 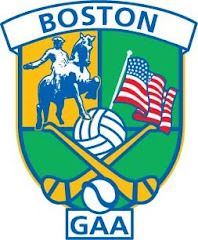 The Boston Shamrocks staged a miraculous second half comeback to overturn an eight point half time deficit and run out two point winners over Tir na nOg. Tir na nOg dominated proceedings in the first half and established a 0-8 to 0-11 lead. With the Brighton girls firing on all cylinders, the Shamrocks struggled to compete. Within five minutes of the restart the Shamrocks had drawn level. Aisling Jennings goaled right from the restart, and almost immediately following the first goal, Louise Collins out another major away. Points from Cathy McEleaney and Jennings brought the sides level, and stunned Tir na nOg. The Shamrocks had the initiative, and a third goal mid-way through the second half from Maria Moolick put the win in sight. Tir na nOg almost came back at the end, trailing by five points a Katie Murphy goal put the Brighton ladies within 2, but time was their enemy – and the Shamrocks friend – and the Shamrocks pull off a tremendous victory. Tir na nOg: F. Gohery, B. Durkan, S. Crampsie, L. Brick, S. Bourke, D. O’Sullivan, A. Molloy, D. McDaid, J. Moran, C. Barrett, K. Murphy, G. McClean, L. McAleev, A. Monaghan, M. Keane. Shamrocks: M. Harrison, M. Cullen, J. Rock, S. Killeen, C. McEleaney, S. Boylan, L. Stephens, M. Moolick, C. Grillen, J. Donnelly, A. Jennings, S. Walsh, L. Collins, T. Kealy C. Tadion. Fr. Tom's Ciaran Moore sets up a shot at goal. For 55 minutes these teams could not separate themselves from each other. It was all square at the end of the first half at seven points each, and at the end of 55 minutes it was fifteen apiece. It was a Cronan Dempsey goal that proved to be the match winner. The sliothar was forced across the goal to Dempsey who pulled on it from close range to finally put some distance between the teams with 5 minutes remaining on the clock. Tom’s opened the scoring in the first half with a point from Noel Kelly, which was answered by Alan McCrabbe with a free. McCrabbe put Tipp ahead with another free, and David Buckley made it 3 to 1 with a nice score from play. Kelly got one back for Tom’s, and McCrabbe put one over from play for Tipp. After Adrian Kelly notched one for Tom’s, John McGrath put another score over for Tipp. Tipp were playing some good hurling and supporting each other well. After Noel Kelly got Tom’s back within one, the sides began trading scores. 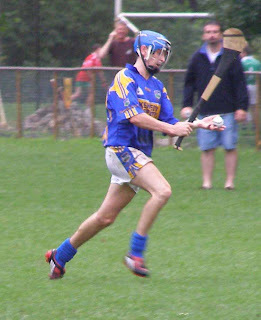 Joe O’Leary put a booming free over from 75 yards for Tom’s, and shortly thereafter bustled through the Tipp defence to score from play. McCrabbe and Ciaran Moore pointed for Tipp and Tom’s respectively and the half ended all square with neither side managing to gain any advantage over the other. Tipp keeper Jim Howard eludes the advances of Trevor Kelly. The second half was a case of your free or mine. Noel Kelly opened the second half with a point for Tom’s and McCrabbe answered for Tipp. The half continued in this fashion, each side answering the other for points from frees. Joe O’Leary was the man on the spot for Tom’s and McCrabbe for Tipp. Gareth Sinnott, John McGrath, and David Buckley also notched points for Tipp and Ciaran Moore, Trevor Kelly, and Noel Kelly did the same for Tom’s. The game looked as though it would take a goal to break the deadlock, and so it was as Dempsey’s goal proved too much for Tom’s to come back from. Buckley followed with two insurance points from play. This was a great opportunity for Tom’s to earn their first two championship points, but Tipp will have been satisfied with the win in a game that could have gone either way. Tom’s: D. Hession, J. Dowling, D. Kennedy, D. Hardiman, Joe O’Leary (0-6), D. Finneran, Trevor Kelly (0-1), K. Dolan, D. Moore, Ciaran Moore (0-2), O. Moran, Noel. Kelly (0-5), Adrian Healy (0-1). Tipp: J. Howard,J. O’Sullivan, R. Hennessey, M. Jordan, F. Devanney, J. Coghlan, Cronan Dempsey (1-1), G. Barry, Alan McCrabbe (0-8), T. Waters, Gareth Sinnott (0-2), David Buckley (0-4), John McGrath (0-2). Declan Lally bursts through the Cork defence to score a goal. Cork and McAnespies met in the final game of the day. With McAnespies at the top of the table and Cork at the bottom, the game itself was a reflection of the standings of each team. 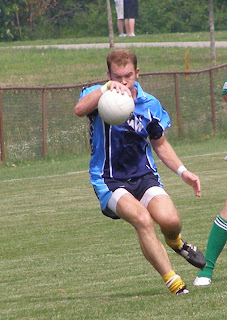 In addition, McAnespies fielded a side that contained numerous players of intercounty pedigree, and even players of the caliber of St. Bridget’s Graham Norton and Oranmore’s Gottsche, each of whom has represented their respective counties of Dublin and Galway, were considered surplus to requirements for the afternoon. Cork probably did not expect to get anything out of the game, except a respectable performance and to some degree they succeeded, though this was not going to be a contest by any stretch of the imagination. McAnespies had put up 1-3 before the patrons had got comfortable in their seats, and any lingering neutrals in Canton stayed to marvel at the quality of the side in the Tyrone strip. Cork pulled back a goal midway through the half, but still went in at half time eight points down. And so it continued in the second half, with Declan Lally and Darren Ryan netting and points going over the bar at will. David Conway opened the scoring in the first half with a point and Johnny Laverty followed with a second. Kevin Cahill forced a rebound over the line for McAnespies first goal and the northerners were motoring. Conor McGourty put on a great display of shooting, the Antrim man put three fantastic scores over the bar. McGourty was not the only one in flying form. 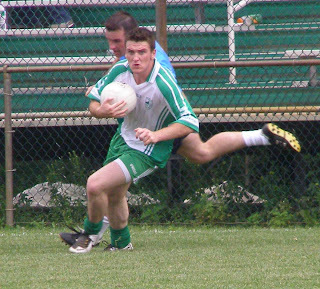 St. Bridget’s clubman Declan Lally was lording it in the middle of the field, and Johnny Laverty was full of running. Further points came from Niall Clancy and Kevin Cahill, while for Cork a Brian Dwyer goal and points from Mike Moynihan and Dwyer got Cork off the mark. Trailing by eight points after the first period, things got no better for Cork. Lally bulldozed his way through the defence for a goal and Darren Ryan came on as a sub and scored a goal and two points. Kevin Cahill and Johnny Laverty rounded out the scoring with points, while for Cork Kevin Moriarty put one over to prevent a blanking in the second half. McAnespies looked very impressive, and while Cork are not flying high this year, even still the quality of the side was hard to deny. With this performance, and Kerry having beaten Donegal on Saturday, it is hard to see who is going to stop McAnespies making it four in a row. Cork: K. Reid, M. Carlioan, J. Leonard, S. Caulfield, Mike Moynihan (0-1), D. Kearns, A. Creagh, K. Connolly, Kevin Moriarty (0-1), C. Bradley, C. Griffin, N. Devlin, Brian Dwyer (1-1). Macs: D. Traynor, D. Donegan, M. Stanbrook, Niall Clancy (0-1), N. Kerr, A. Feeney, Declan Lally (1-0), D. McBride, C. McCrory, Johnny Laverty (0-6), Conor McGourty (0-3), Kevin Cahill (1-2), David Conway (0-2). Sub: Darren Ryan (1-2). James Carlin tries to get something going for the Gaels. 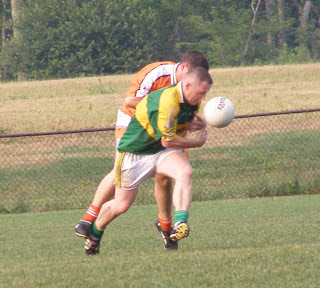 The Wolfe Tones put in a good solid display of football to win both points over the Connemara Gaels. Tight at the back and able to open it up in the forwards, the Tones were always one step ahead of their opponents. The Gaels hung in there for most of the first half, but with time winding down, the Tones hit with a goal with the last kick of the first half to set them up to kill off the game in the second. The Wolfe Tones set the tone for the game early in the first half with some stout defending and some good shooting and at the end of the first 30 were six points ahead. The Gaels may have felt a little unlucky with the Tones snatching the goal at the very end of the first half. Gary Collins found himself unmarked 21 yards out and beat John Flaherty with a shot into the far corner. In the preceding 29 minutes the Tones had established a three-point lead and had their back line to thank as much as their forwards. The Gaels had plenty of possession and should have had a better return than three points, but the Tones forced numerous turnovers. In the forward line Sean Kelly, Marty Farrell, and Sean McVeigh each pointed, while for the Gaels it was Frank Niblock who pointed three times, twice from frees. With the Gaels still in touch and half time looming the goal was a serious blow. 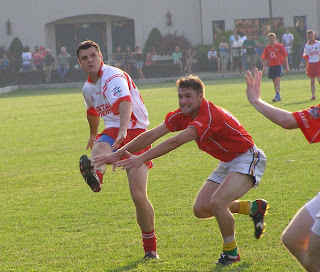 Sean McVeigh breaks up another Gaels attack. The second half lacked some spark as curiously the Gaels seemed a bit lethargic and unable to raise their game to a level necessary to threaten to overturn the deficit, while the Tones were happy to sit on their lead. This was underlined by the fact that each side managed only two points for the second period. The Tones got the first score of the half from corner forward Sean Kelly shortly after the restart, and the following 10 minutes was marked by numerous stoppages and a scuffle or two. Marty Farrell put the Tones eight points to the good on 13 minutes, and a comeback from the Gaels looked increasingly unlikely. James Carlin pointed from a free after 19 minutes, the Gaels first score of the half, and Frank Niblock scored a good point from play four minutes later. The Gaels lifted their game for the final ten minutes, but the horse had already bolted the stable. With a businesslike win the Tones are looking good for a spot in the senior semi-finals. Tones: W. O’Dowd, N. McKenna, K. McGreevey, K. Gorham, D. Scullane, E. Hickson, W. Milner, S. McVeigh, Gary Collins (1-0), J. Murphy, Collie Farrell (0-2), Sean Kelly (0-3), Marty Farrell (0-3). Gaels: J. Flaherty, B. McLoughlin, T. McKiernan, P. McNicholas, M. Geoghan, D. Burns, R. Hughes, R. McAltone, James Carlin (0-1), Frank Niblock (0-4), V. O’Malley, T. McDonagh, G. Crossan.